This success is reflected in a rapidly growing customer base of NEMs, service providers, enterprises and government agencies, as well as a slew of global awards. 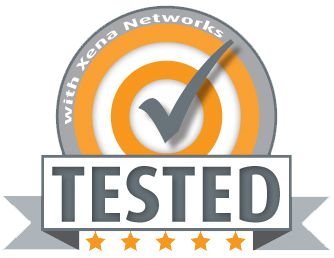 Xena’s offers a wide selection of L2-7 Gigabit Ethernet test solutions suitable for testing of a broad spectrum of network appliances. For Layer 2-3 this includes taps, switches, routers, NICs, packet-brokers, backhaul platforms, residential gateways, while for Layer 4-7 it includes switches, load-balancers, proxies, firewalls, and bandwidth shapers, amongst others. The company’s unique product portfolio covers easy to use, high-performance and functional test solutions spanning network Layers 2-7, coupled with an industry-leading value for money offering. Ethernet traffic network test and analysis platforms scales from 10 Mbps to latest 100 Gbps Ethernet standards. A plethora of new Ethernet speeds are right now being standardized and Xena are working to stay ahead of the curve and deliver new solutions for emerging 2.5GE, 5GE, 25GE, 50GE and 400GE Ethernet interfaces. Wire-speed Layer 2-3 traffic generation and analysis for performance testing, functional testing, performance logging and monitoring, plus a suite of industry standard test suites for RFC2544, Y.1564, RFC3918, and RFC2889 testing. A unique and ultra high-performance L4-7 test platform for end-to-end emulation of realistic media-rich traffic and network conditions, for ensuring and validating the scalability and performance of next generation high-performance physical or virtual network infrastructures and components. The industry’s easiest and most versatile scripting interface which makes it easy for users to quickly automate and script their test from any location, scrip language and environment. Modern and easy-to-use graphical user interfaces (GUI) for a wide range of test applications, plus web-based access to all test applications. A rapidly evolving product feature set, with a continuous flow of new software releases latest industry standard functions and features for L2-3 testing and L4-7 testing. You can try our solutions right now. Xena offers a free online demo. Simply log in and in less than 2 minutes, you can download the software, connect to our demo system, and start using all the features and options. Download this PDF for a detailed summary of our Valkyrie L2-3 solutions. Download this PDF for a detailed summary of our L4-7 solutions. Download this PDF for a brief introduction to Xena.